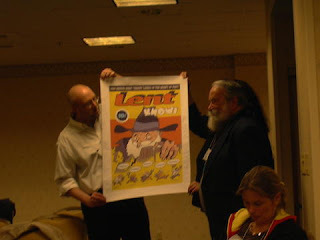 One of the pleasures of this year’s PCA was presentation of the Interplanetary Journal of Comic Art to its inspiration, international comics scholar John Lent. While I couldn’t attend myself (due to chairing another panel at the same time, argh!) everyone took pictures of Gene and Wendy presenting the posters (including one of the back cover by Ralph Steadman [fan girl moment, “I’m in a book with Ralph Steadman!”]) and the festschrift to John, who was apparently touched almost beyond words. When I saw him shortly after he was still sparkling with joy. His wife Ying said that he stayed up late that night reading it cover to cover. Comics folks from around the world contributed to this hilarious book in honor of the man who really forged a trail in comics scholarship. Kudos to Mike Rhode for doing all the hard work of coordination, editing and whip cracking over the slow contributors. I can take credit for suggesting that subtitle, mostly because it does convey the seriousness of what has been undertaken. I’m always quoting from this or that festschrift in honor of an important medievalist. While many the contributions are humorous, hard work went into making them so — and all in honor of John. It’s good to have such inspiration before you while writing.And the book is such a bargain at only $10 — proceeds support the International Journal of Comic Arts, too!